he ability to track & trace is in demand for food supply systems. 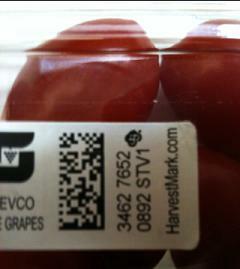 The labeling requirement is for a case label, PLU label, or UPC label to have the HarvestMark® system located on the label. This provides instant trace-back and enables easy trace-forward in response to suspected food borne illness or recall events. Giving each product a unique identity, the solution creates one-to-one communications providing relevant product information 24 hours a day, seven days a week. Unit level authentication is available anywhere, anytime to anyone with a camera phone, a hand-held scanner, SMS, or access to the internet.